If your child is begging you to use the real camera, this Show Cam is the ideal kid’s version! Built for playtime, with simple controls, big buttons and kid-sized hand grips, they will be able to take digital photos to share with family and friends. Flip to projector mode and they can project their images on to a wall to show everyone instantly. General information: Size H17.8, W25.4, D13.5cm; Batteries required: 4 x AA (not included). For ages 3 years and over; EAN: 5010994741921; To be used under the direct supervision of an adult. 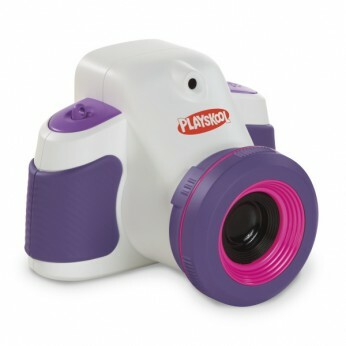 Add fun animations, stories and sounds to pictures with the Playskool Showcam Digital Camera and Projector! With more than 50 silly effects to choose from, this 2-in-1 camera and projector lets them snap pics and customise them! With the flip of a switch they can project their pictures too. The buttons, controls and grips are all kid-sized for easy use, and the editing functions are built in so they don’t need software. It’s easy to save, print and email pictures if you have a USB cable! Get your little ones creating digitally with the Showcam Digital Camera and Projector!Digital camera comes with hand strap and instructions. This toy costs approximately £39.99 (for the latest and best prices make sure you check our retailer list for the Playskool Showcam Pink above). In our review of Playskool Showcam Pink we classed it as being suitable for ages 3 years, 4 years, 5 years but recommend you check the manufacturer specific advice before purchasing.